The HP StreamSmart 410 helps math and science students visualize experiment results by streaming data in real time. 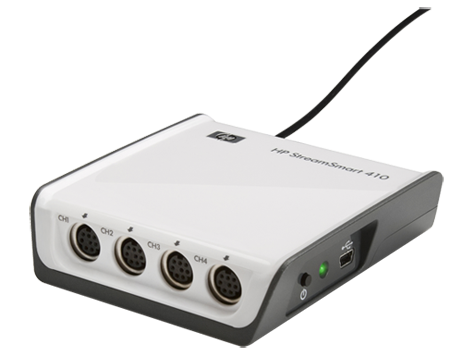 Make experiments come alive with the HP StreamSmart 410. Designed for use in math and science classes, the StreamSmart 410 connects real-world data to a student’s graphing calculator, with accurate and immediate real-time streaming. Suited for use in a wide range of subjects, including: math, science, pre-algebra, algebra, trigonometry/pre-calculus, calculus, statistics, earth science, environmental science, physical science, physics, biology, and chemistry. • Watch and learn with real-time data collection as it occurs. Learning becomes exciting when you can capture up to four streams of data (motion, sound, temperature, light, etc.) and simultaneously see the results in real time – without any delays! • Automatically sends the collected data to the built-in analysis tool. No need to learn a new set.